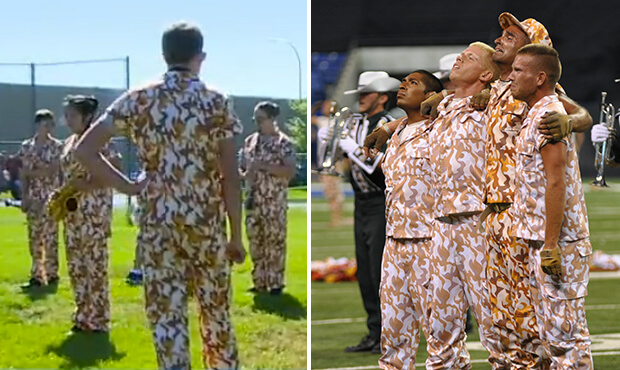 The Madison Scouts donated uniforms used in 2013 (seen right) to the Osseo High School Marching Band. If those marching band uniforms look familiar it's because they are. Worn by the Madison Scouts' color guard during the 2013 Drum Corps International Tour for their 75th anniversary "Corps of Brothers" production, the corps donated them to the Osseo High School Marching Band in Minnesota after the season. When the band's trailer was vandalized in August causing damage to equipment and the uniforms, band boosters and local volunteers came together to make sure that the students would march forward on Saturday for their first performance of the school year.